Islamic State militants have taken control of almost all of the ancient Syrian city of Palmyra, a UNESCO landmark, according to a monitoring group. The city was captured after bloody clashes with the Syrian Army on Wednesday. The Syrian Observatory for Human Rights said the group had seized almost all of the city. IS militants entered the city from the north “without their vehicles,” said Rami Abdel Rahman, the Observatory’s chief, according to AFP. Pro-government fighters have withdrawn from city, also known as Tadmur, according to the Syrian state TV. Reports suggest that Islamic State fighters are trying to enter the city’s historical sites. The pro-government National Defence Forces (NDF) have evacuated civilians from the area, state TV reported. IS militants entered Palmyra from the north earlier Wednesday and gained control of a local security office and a school, RT Arabic reported, сiting local sources. According to a correspondent reporting from Homs, there were clashes between the Syrian army and ISIS in the northern part of Palmyra, and the militants intensified shelling government forces' positions. Meanwhile, hundreds of statues have been moved from the Syrian Palmyra to locations safe from IS militants on Wednesday, Syria's director of antiquities, Maamoun Abdulkarim, told Reuters. Last week IS militants battled with Syrian troops within 2 kilometers of Palmyra, the Syrian Observatory for Human Rights reported, raising fears the jihadists would completely wreck the site, which UNESCO describes as a landmark of "outstanding universal value." Fierce fighting took the lives of 110 combatants, as the militants appeared to be very close to the ruins. 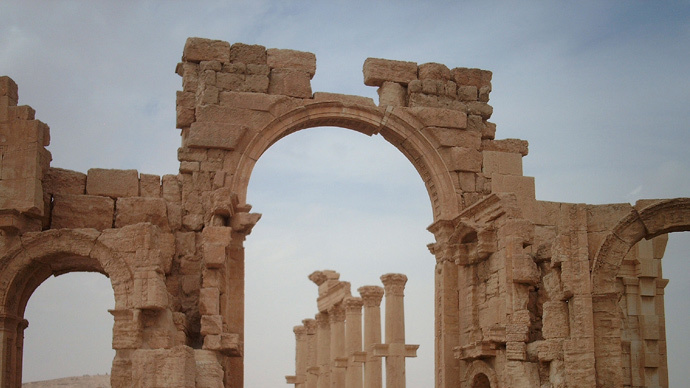 "Palmyra is under threat," the Observatory director warned last week. Many fear that if Palmyra, which harbors the ruins of a great city that was once one of the world's key cultural hubs, falls into the jihadists hands, it would suffer a fate of the ancient Assyrian city of Nimrud, which they ruined earlier this year. Last month a seven-minute video emerged, showing ISIS militants destroying the historic landmark, Nimrud, which dates back to the 13th century BC, near the IS-controlled city of Mosul in northern Iraq. It showed the militants drilling away at sculptures believed to be some 3,000 years old. IS militants, who have created a self-proclaimed caliphate in northern Iraq and parts of Syria, previously declared that they deem the artifacts as idolatrous. They have been waging a campaign to obliterate cultural sites and relics that fail to fall in line with their ideology. Another video, released in April, showed IS fighters recklessly destroying the 2,000-year-old ruins in the ancient city of Hatra in northern Iraq, 110 kilometers south of Mosul. In February, the jihadists obliterated ancient artifacts in the Mosul Museum and blew up the Mosul Public Library using homemade bombs. They also burned a number of books in Mosul’s Central Library, sparing only Islamic publications.